After shocking the tournament field with Day 1 upsets in Doha, Balanga and Pasig couldn't overcome better-prepared opponents who were able to elevate their game. 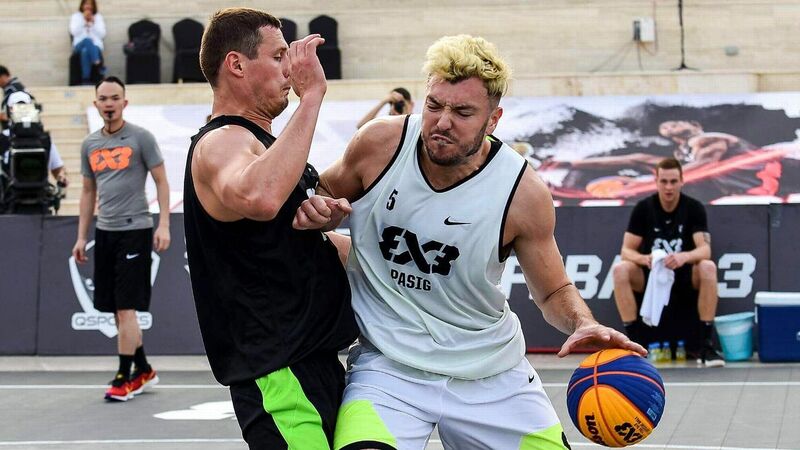 The two Philippine teams seeing action in the FIBA 3x3 World Tour Masters in Doha were the talk of the town after both swept their respective groups, beating top-ranked teams along the way. ICYMI, Pasig and Balanga both won their first two games in the FIBA 3x3 World Tour Masters in Doha, Qatar. Chuck Araneta takes a look at where the two semifinal series left off before the PBA took a four-day Holy Week break. Two Philippine teams go up against the best 3x3 clubs in the world in the first leg of the FIBA 3x3 World Tour Masters in Doha. Chooks-to-Go Pasig and Balanga have arrived in Qatar for the FIBA 3x3 World Tour Doha Masters. Former PBA import Renaldo Balkman and his business partner Robert Foster discuss setting up a PH basketball camp. Renaldo Balkman expressed his interest to play in the PBA again and confirmed his return to Alab Pilipinas next season after an abrupt ending to their ABL title defense. The Magnolia Hotshots finally got on the board with an 85-74 win over the Rain or Shine Elasto Painters in Game 3 of the Philippine Cup semifinals. Mark Nonoy is surprised how fast things have picked up in his basketball career. Cignal-Ateneo came one-point short of tying the record for biggest winning margin, defeating McDavid by 75 points, 106-31. Elasto Painters relied on defense and 3-point shooting to go up 2-0 in their Philippine Cup semifinal series against the Magnolia Hotshots. Did you know that an NBA champion team once came to town to play a PBA selection? Or that the 3-point line was once a semi-circle? On the PBA's 44th anniversary, here are 44 interesting trivia about the league. Chadao-FEU turned back Perpetual, 83-64, to pull its record even in the 2019 PBA D-League Thursday. More Hardware for the Kraken? Valencia City Bukidnon-SSCR tore Wangs Basketball into shreds with a 96-64 mauling of Wangs Basketball in the 2019 PBA D-League Tuesday. Kai Sotto did several workout sessions with coach Rory Jones, a strength and conditioning coach who also happens to be Andray Blatche's personal trainer. Both McDavid and Centro Escolar University registered victories in the PBA D-League on Monday. Jason Perkins had an impressive night as the Phoenix Fuel Masters cruised past the Alaska Aces to book a semifinals seat in the PBA Philippine Cup. The 1Bataan Risers fell in heartbreaking fashion against Japan's Tokyo Dime.Exe in the finals of the Chooks-to-Go 3x3 Asia Pacific Super Quest. Ryan Monteclaro, who played for the Saigon Aces in the 3x3 Asia Pacific Super Quest, shares the Philippines and Vietnam have "a lot of similarities." The Barangay Ginebra Kings moved to within a win of a semifinal slot with a convincing win over rivals Magnolia Hotshots in Game 1 of their quarterfinal series. The San Miguel Beermen banked on a big fourth-quarter run and survived a last-second shot from the TNT KaTropa to take Game 1 of their quarterfinal series. Barangay Ginebra pulled off a wire-to-wire victory over the Magnolia Hotshots, 86-75, in their #ManilaClasico playoff matchup. The San Miguel Beermen completed a comeback win over the TNT KaTropa, 80-78, to steal Game 1 of their best-of-3 quarterfinals series. Playing at what Taylor Statham described as a "whole other level", Philippine teams Pasig Grindhouse Kings and 1Bataan Risers proved up to the challenge and made their way to the quarterfinals of the Chooks-to-Go 3x3 Asia Pacific Super Quest. The Alaska Aces claim the final spot in the Philippine Cup playoffs and will face the top-seeded Phoenix Pulse in the quarterfinals. Breaking down the Manila Clasico, the San Miguel-TNT corporate rivalry, and all the subplots heading into the Philippine Cup quarterfinals. Magnolia has won six of its last eight but Chito Victolero still thinks Barangay Ginebra is the favorite in the Manila Clasico quarterfinal clash. Local squads Pasig Grindhouse and 1Bataan will be going up against several crack international 3x3 players in the Chooks 3x3 Asia Pacific Super Quest. 1Bataan will figure in the group of death in the Chooks-to-Go Pilipinas 3x3 Asia Pacific Super Quest. As the 2019 PBA D-League approaches its halfway mark, five players have stood out with their stellar play. Cignal-Ateneo put a stop to Petron-Letran's winning run, while Go for Gold-CSB held off a comeback attempt from Batangas-EAC on Thursday. NorthPort secured the seventh seed after squeezing past Barangay Ginebra on the last day of the elimination round Friday. The Magnolia Hotshots set up a Manila Clasico quarterfinal duel with rival Barangay Ginebra after an easy win over the NLEX Road Warriors. We list down five moments that made the 2019 PBA All-Star Weekend one for the books. During a PBA All-Stars promotional appearance at a mall in Pangasinan, fans screamed the loudest for Big Game James. The Pasig GrindHouse Kings are champions of the first Chooks-to-Go 3x3 President's Cup after a rousing win over rivals 1Bataan Risers that was worth a cool one million pesos. The Pasig Grindhouse Kings secured first place in the Chooks-to-go Pilipinas 3x3 tournament, assuring them of a slot in the FIBA 3x3 World Tour Masters in Doha later this month. Javee Mocon's putback off CJ Perez's missed turnaround jumper as time expired gave the Rookies-Sophomores a 141-140 win. For the fifth time in his career, Rey Guevarra is the Slam Dunk champion. Alaska, NLEX and NorthPort are battling over two Philippine Cup playoff spots. This is what each team needs to happen to make the quarterfinals. The NorthPort Batang Pier can secure a spot in the Philippine Cup quarterfinals with a win over Barangay Ginebra. Kai Sotto sees European basketball as the surest path for an international player to reach the NBA. Kai Sotto may be on his way to pursue his dream of playing in the NBA, but he remains committed to the Philippines' national basketball team. Kai Sotto will make a run at playing in the NBA in 2021 or 2022. Here's how he arrived at the decision. ESPN5's Yoyo Sarmenta lists down several players who made a mark over the course of the NBTC National Finals. Jalen Green and David Carlos put on an impressive battle in the championship round of the 2019 Chooks-to-Go NBTC Slam Dunk Contest on Saturday. Filipino-American cagers Jalen Green and Kainoa Ballungay have some advice for Kai Sotto regarding the gentle giant's offers in Europe. Wangs Basketball scored back-to-back wins after drubbing Perpetual, while Petron-Letran beat Family Mart-Enderun to extend their win streak to three games. Who were the top rookies for Week 9 of the PBA Philippine Cup? Charlie Cuna lists them down. Che'Lu Bar and Grill had to survive a late rally from McDavid, while Marinerong Pilipino dropped CD14 Designs-Trinity University of Asia. Behind Alex Cabagnot, the San Miguel Beermen pulled out a huge win over the Alaska Aces in the Philippine Cup on Sunday. The Batang Pier arrested a six-game slide and boosted their chances of grabbing a playoff spot after drubbing the KaTropa in the PBA Philippine Cup Sunday. Ginebra rolled to a third straight victory at the expense of NLEX, 106-95, in the 2019 PBA Philippine Cup on Saturday. Yeng Guiao needed some time to get re-acclimated to the PBA but now he and NLEX appear to be peaking just in time. TNT kept its top-two hopes alive after holding off a fighting Columbian side, 101-98, in their 2019 PBA Philippine Cup match Friday. The Magnolia Hotshots close in on a Philippine Cup playoff spot behind Rome dela Rosa's 17 points and a 97-87 win over the Blackwater Elite. This is your one-stop hub for everything related to Gilas Pilipinas and their 2019 FIBA World Cup campaign.